Earthquake: The Big One was also designed by the Totally Fun Company and Ride & Show Engineering and was meant to be a near clone of the Universal Studios Hollywood staged event. The premise is a simulation of an 8.3 earthquake. The exterior of the attraction was patterned after a San Francisco cable car depot and the exterior queue brought us past various props in a storage area. We would then experience 3 different preshow, each explaining a different aspect of the movie making business. Finally, we enter a reproduction of West Oakland station on the Bay Area BART subway system and board a 3 cars subway with locking doors and benches. Car 1 face backward while car 2 and 3 look forward when exiting the station. After verification that all doors are locked and everyone is seated, the lights dims and we enter a dark tunnel with flashing lights and we make a left turn, “travelling under the bay”. 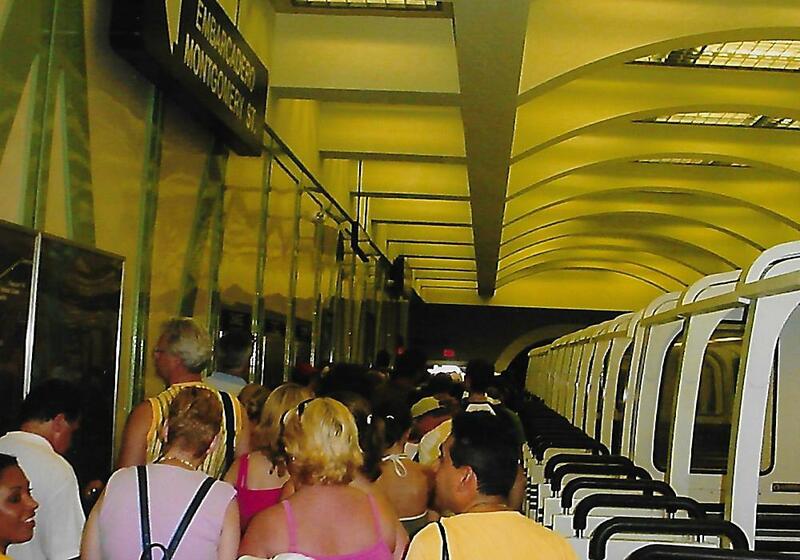 The subway train features no active restraints, but locking doors with bars on top to prevent riders from exiting. 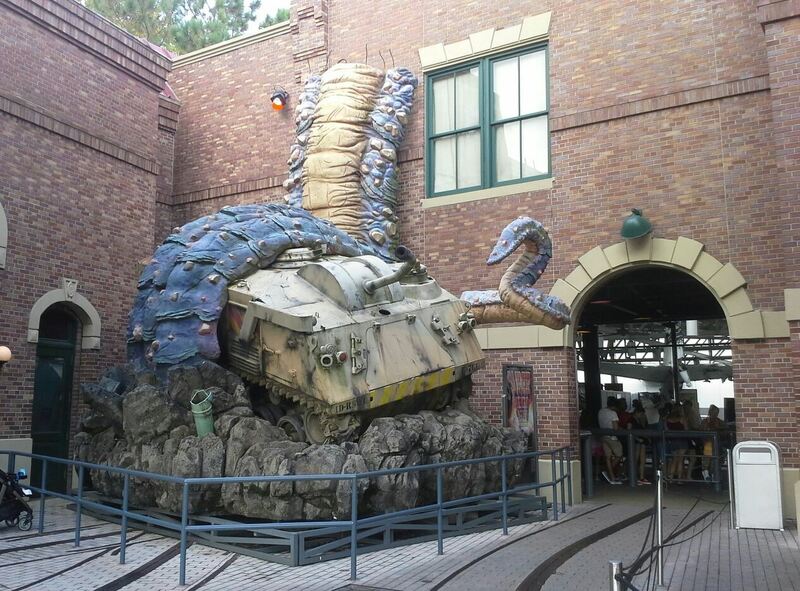 This is the attraction exit in 1998. As soon as we stop inside Embarcadero Station, we hear and feel a minor tremor. The main difference between the two versions is that the set is patterned after the actual station with none of the studio equipment present in Hollywood. A panicked announcer inform us that this is a “minor tremor” and to remain calm. It cuts as we seemingly lose power and the tremors intensify. The ceiling lights start collapsing, as well as various lights. Electric panels shoot off sparks and the ground start to break, releasing smoke and various fire spots are turned on. The roof collapses later than in Hollywood and allows us to really take in the incredible show action equipment and special effects around the station. 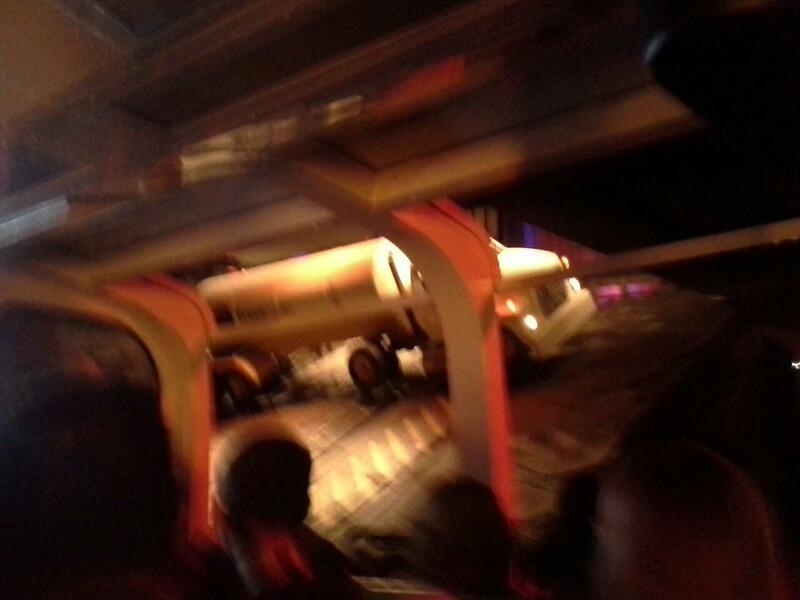 Once the roof caves in, a smaller scale tanker truck slides toward us before crashing into a column. The truck has “Atlas Propane” on it and the back of the tanker explodes in a large explosion with the diesel tank also bursting into flames. This was the most complicated and elaborate scene of the attraction, as the truck is on dual chain tracks and this allows it to slide in a natural fashion toward our helpless subway train. Until the early 2000’s, smoke came out of the truck exhaust pipe to push the realism aspect. There was also a lot of smoke used to hide the truck until it broke through and hit the support column. After it wraps itself around the pillar, another power transformer falls down behind it and this ignites a Propane “leak”. A trail of fire then runs into the stairwell which also blows up. Two large fire nozzles shoot fire between the truck and tunnel and they turn off right as the derailing subway enter and goes off the rails. This effect is very different than the Hollywood Earthquake since there is no fire involved there and the subway in Hollywood just breaks in two. In Orlando, the front car flies up and smashes into the ceiling. 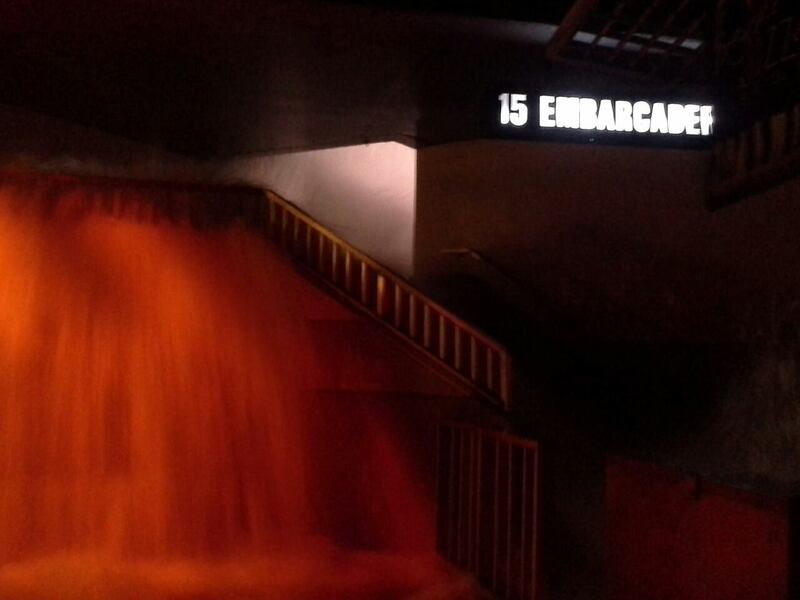 The fire and smoke effects are turned off and some of the broken floor reset as the station is flooded by thousands of gallons of water that rush down the stairs. Just as we think it is over for us, a team member comes out and yells CUT! from the control booth. He informs us we just survived an 8.3 Earthquake and then the train rolls out backward back to the loading station as the set reset. The water splashing down the stairs. Even though it is very close to the Hollywood Earthquake, more pyro effects were included and some scenery modified. The electric arc power transformer was not included here and replaced by more fire effects. Ride & Show Engineering designed and manufactured the subway cars and motion bases, but there were many issues that plagued the ride at first. Those issues were resolved later in 1990 and the ride performed without a hitch until it closed down in 2007. In October 2007, Earthquake was closed for a major transformation. It reopened in 2008 and the storyline was reworked into being a shoot for a fictional disaster movie called “Motha Nature” starring Duane “The Rock” Johnson. 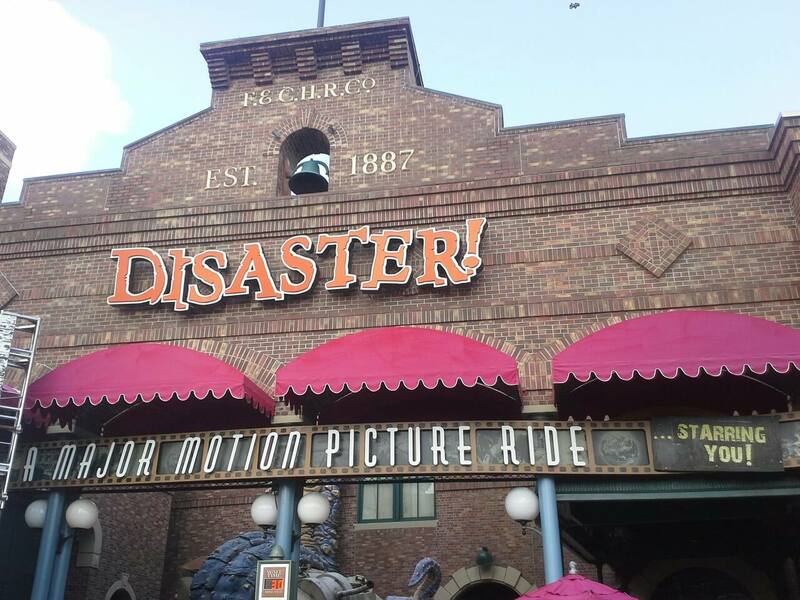 The ride was renamed Disaster and now take place at Disaster Studios, a nearly bankrupt studio specializing in over the top chaotic disaster movies. Frank Kincaid (played by Christopher Walken) through the magic of Musion Technology interact with the assistant director in the second preshow and then, green screens assist in the third preshow. Audience members were chosen in the first room to be a part of various scenes which are then spliced in with computer images to fit in the trailer of the movie. The brand new sign on the San Francisco Transit roundhouse that is the facade of the attraction. The brand new waiting line for Disaster! It features scenes from the fake Studio disaster movies. 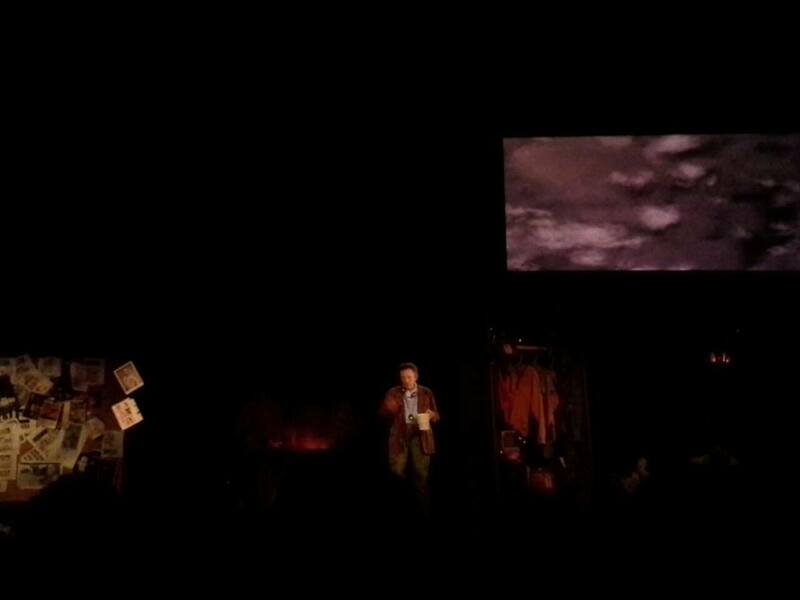 Christopher Walken appearing as Frank Kincaid in the second preshow through the magic of Musion. The ride segment was redressed, notably adding the name of the villainous company “Trans gulp” to the tanker truck. The scene also has a lot more lights as various cameras around the subway train shoot our reaction. The previously anti climatic ride back to the loading station is now a moment of intense laughter. On screens mounted in the train, we see the trailer for the movie featuring our footage, the extras antics and the premade footage featuring Duane Johnson. The rebranded tanker truck sliding down toward the subway train. Disaster closed on September 7th, 2015 and will be replaced by a new Fast and Furious attraction. This entry was posted in Special effect and tagged Christopher Walken, Disaster, Earthquake, Earthquake: The Big One, Frank Kincaid, The Rock, Universal Studios, universal studios florida. Bookmark the permalink. ← Who shot the fuel dock? Part 3 of Fire!